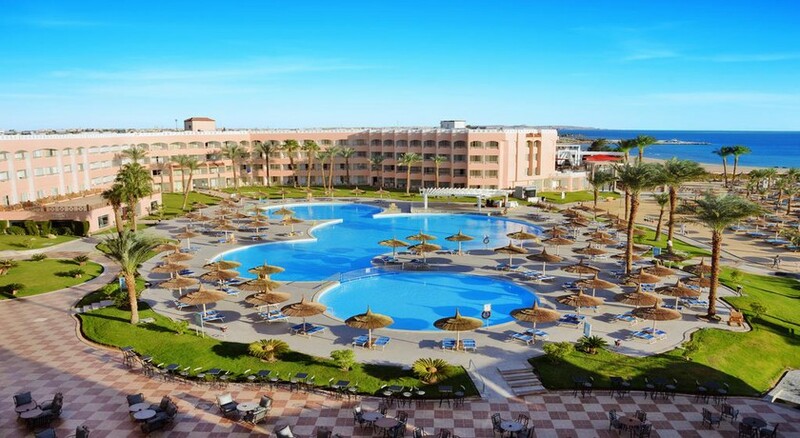 Set on the Red Sea coast in Hurghada, Egypt, the beachfront Beach Albatros Resort is a great choice for an all-inclusive holiday. Spread across 72,000sq m, it houses a private beach, along with beautifully landscaped gardens and lots of dining and leisure options. There are two large swimming pools – one that’s heated during winters and one filled with salt water – where you can lounge with a drink in hand on the sun terrace. There’s a choice of international delicacies to pick from, with several restaurants, cafés and bars, besides a disco on-site. Unwind on your vacation with a trip to the hotel’s spa, where you can use the Jacuzzi or indulge in therapeutic massages. Kids will love the aqua park, besides the exclusively children's pool and playground. A mini-club will ensure there are enough fun things to keep them entertained. You can also play beach volleyball, go scuba diving or dance all night at a beach party. The hotel also organises animation and live shows in the evenings. 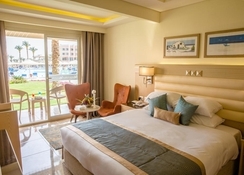 The Beach Albatros Resort is 20 minutes on taxi or bus from the city centre and a 15-minute drive from Hurghada Airport. It’s also around 3 km from the Jungle Aqua Park and 16 km from Makadi Bay Water World. The hotel features 631 spacious rooms, which come with large private balconies or terraces. While the standard guest rooms feature king or queen-sized beds, the suites sport two bedrooms, a living room and bathroom, along with a private hot tub. You can also opt for rooms overlooking the pool or the sea. The hotel offers a variety of cuisines, including Chinese, Japanese, Thai and Indian specialties served at 6 restaurants. 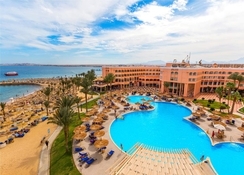 There are 5 bars and lounges that include a beach bar and poolside bar, to choose from, such as LAsiatique, Mediterranean, Il Caminetto, Tagine, Salsa Mexican, Zum Kaiser, and Salsa Mexican. Guests can also visit the 2 cafés and a disco/pub in the hotel. Head to the beach to spend hours soaking up the sun or snorkelling and diving in the calm waters. Spend time in the Jacuzzi or sauna at the full-service spa on the premises, where you’ll also discover a health club, an outdoor as well as indoor pool. There are also three tennis courts, a diving centre and fitness centre. Kids will be entertained with waterslides, besides getting their exclusive club, playground and separate pool.